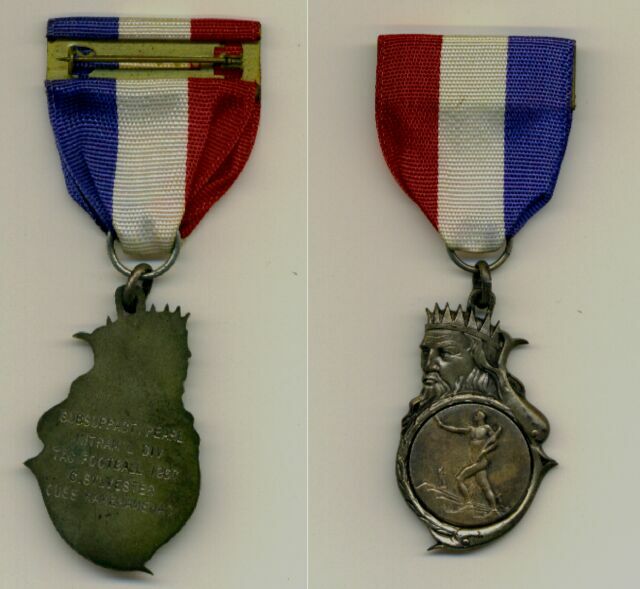 Attached is a scanned photo of a "Football" Medal that the players of the Gold Crew received from the SUBSUPPACT, PEARL INTRAM'L DIV TAG (Flag)FOOTBALL LEAGUE in 1967. I believe we won the League (at least that's what I tell everyone who sees the metal). But there is a more interesting Story that is associated this Medal. The Story centers around a Change of Command Ceremony that took place in 1968.The Ceremony involved a Dress White Inspection with Medals. Some of the Team Members decided that it would be appropriate to wear this Football Medal along with the traditional Military Medals on their Uniforms. During the Inspection, the Inspecting Admiral was making his way through the ranks, when he stopped at one of the Team Members, who was wearing the Football Medal, and reviewed his uniform for the longest time. The Admiral moved on without comment, but had a puzzled look on his face as he left the Sailor. The Admiral moved on to inspect a few more Crew Members, but promptly returned to the original Sailor on whose uniform he had noticed something unusual. He told that Sailor that he was unfamiliar with one of the Military Medals that he was wearing and wonder what Medal it was. The reply the Admiral received was, It's my Football Medal, Sir. I don't remember the Admirals reaction, but he moved on with the inspection, but shortly returned to the Sailor once again and said. Okay, I understand it's your Football Medal, but why is it in front of your National Defense Medal. The Sailor then replied, Sir, we had a better defense than they had. The Admiral smiled and moved on. In a future briefing prior to an upcoming Personnel Inspection, we were told there would be no Football Medal worn on our uniforms. Hopefully others will remember this occasion and add their memories.